Thanks to everyone who took part in my first public Plan in a Day Life ‘On Purpose’ workshops. It was a big step for me to share my experience and guide others to develop their plans, and I couldn’t be happier with the results and feedback. This is going to be an annual occurrence for many years, and it’s wonderful to see more and more people wanting to follow their passions and live ‘On Purpose’. 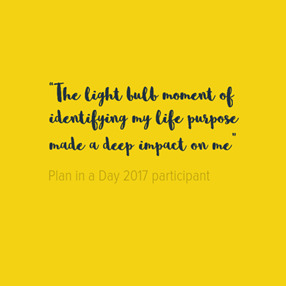 For many participants, this was the first time they had devoted time to plan a year of their life. It was great to see them walking away with clarity of purpose and clear actions for 2017, which will be a wonderful foundation for their future journey. Among the highlights was a couple of real ‘goosebump’ moments, when individual participants fully awakened to their purpose or driver – something bigger than what is happening for them day-to-day. There was also such generous sharing of knowledge and support between participants, and this discussion helped tease out answers to help turn thinking into action. I reminded everyone (including myself!) that writing the actions doesn’t make them happen. We have to take actions to get results. Looking forward to hearing about the success people have during 2017 living ‘On Purpose’. Can’t wait to host 2018 workshops! Susan Benedyka is launching her 2018 The Edge Mastermind Group. This program is tailored for private, corporate and government sector future leaders who want to become more holistic leaders in their fields. 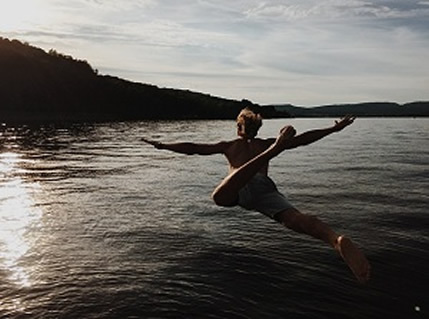 There is a focus on individual aspirations, and being challenged and stretched in a supportive environment to bring each person's vision to life. Susan's role is to support, help define the challenges and assist reaching goals. If you are interested in becoming part of this dynamic click here The Edge 2 - Mastermind Group. It's been a wonderful gathering of The Edge Mastermind group, with everyone embracing the concepts. Seeing how they are challenging themselves and each other in the safe and nurturing environment is such a pleasure! One of the great outcomes are the peer challenges and group challenge. The temperament session also revealed a deeper understanding of self and others, and this enables more growth to meet the set challenges. The Edge Mastermind Group - an exciting new journey! My facilitation work always gets me excited and last Thursday was no exception! Launch of the first Edge Mastermind class was fantastic, and we’re blessed to have six people, all with exceptional talents wanting to challenge themselves, surrounded by like-minded souls in a safe, nurturing environment. There was plenty of energy and a positive vibe in the room. Settling on our collective goal and how we want to ‘be’ was a wonderful exercise. I can tell the level of personal growth is going to be high and beneficial for everyone, as they work towards fulfilling their potential. In-depth discussions took place on everything from spiritual to operational, and there was plenty of wisdom and advice was shared during our issues of the day session. This included a fascinating chat about self-confidence versus self-esteem, with plenty of learning on this issue to help people get the balance right, in keeping with their values. Importantly, the group did exceptional work to narrow down daily topics for the next five classes. Everyone is looking forward to the structure and accountability built into the next five weeks and the five amazing topics to discuss. I can’t wait to get back together on 15 December and share the learnings from the topic, Temperament. If you’re at all curious about the term ‘spaghetti on the wall’ come along to the next Mastermind and find out! Call me for information on 0417 449 636 if you’re interested in joining us. My plan is to host more Mastermind classes in 2017 across the North East, to help people get ‘The Edge’ they need to live ‘On Purpose’ and fulfil their potential to make this world the best place it can be right now. Fear is something we all confront when starting a small business. This is an exciting opportunity for growth, so feel the fear and walk through it - there's light at the end of the tunnel, and success to be enjoyed. Thanks to Karen Nankervis for the opportunity to speak at the recent Biz Hive dinner, and journalist Genevieve Barlow for the article in this week's Weekly Times outlining a few of my thoughts on fear. READ the article on Facebook. 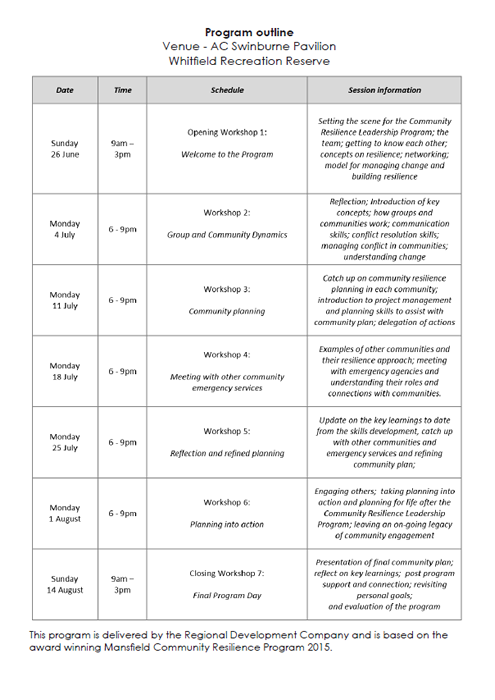 King Valley Community Resilience Leadership Program open for registration! 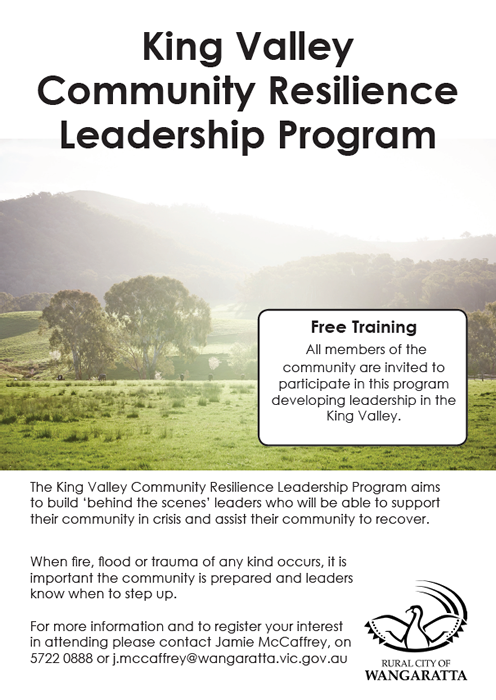 We are pleased to announce that the King Valley Community Resilience Leadership Program is now open for registration. The King Valley Community Resilience Leadership Program aims to build 'behind the scenes' leaders who will be able to support their community in crisis and assist their community to recover. Greater Shepparton Community Leadership 2016 Launch! The Greater Shepparton City Council (GSCC) Leadership Program is underway with the Program Launch held last Wednesday 13th April, and the Opening Program Session for participants yesterday. We are looking forward to a successful year for all involved and the anticipation of some wonderful community projects being brought to fruition. Well done to all the participants selected into this year's Program. Photo: GSCC CLP Launch, Wednesday 13th April. Greater Shepparton City Council 2016 Community Leadership Program - Applications now open! Greater Shepparton City Council is seeking participants for its 2016 Community Leadership Program. 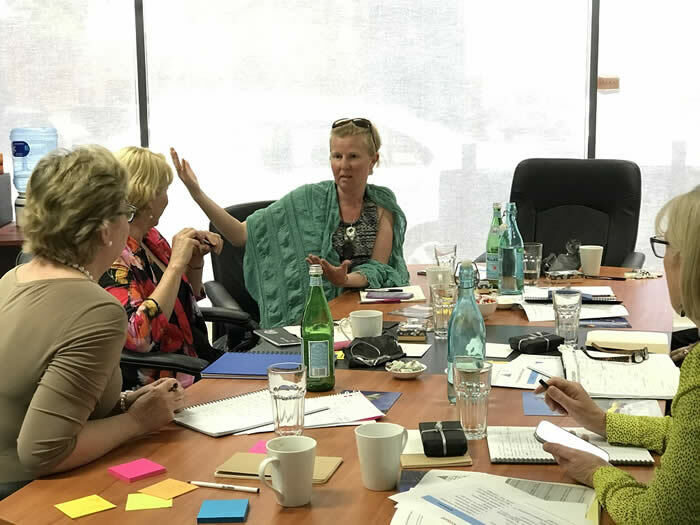 The program is aimed to develop active and engaged community members within the Greater Shepparton municipality who wish to increase their leadership potential and influence within the community. This program will run from April until November 2016, and RDC will be once again facilitating this valuable program with both Susan and Suz on board and looking forward to another exciting year. If you would like to talk further about whether this program is for you, please come along to an information session on Wednesday 24 February at 6.30pm at the Greater Shepparton City Council Offices, 90 Welsford Street, Shepparton. In addition to commending Mansfield Shire Council on winning the state 2015 Resilient Australia Award for their Community Resilience Leadership Program that they completed earlier this year, we would like to extend a huge congratulations to them for being runners up of the penultimate prize, the National 2015 Resilient Australia Award. The judges recognised the high quality of Mansfield's Community Resilience and Leadership Program with a highly commended status. There were 106 entrants this year with 14 proceeding to the National Final. Starting in 2014, the inspirational Community Resilience Leadership Program facilitated by The Regional Development Company brought together a broad cross-section of passionate and connected local community members to explore and expand their leadership role in building community resilience and to develop action plans which address local issues. The next step was for those emerging leaders to share their visions and learnings from the program, and alongside their community peers and invited guest speakers with backgrounds in emergency recovery and resilience development, participate in the Mansfield Community Conference 2015. Well done Mansfield Musical and Dramatic Society! As part of the work RDC has done with the Mansfield Musical and Dramatic Society (MMuDS) in assisting them with their strategic review during September this year, MMuDS has ratified the draft wording of their new values statement in their final meeting of 2015. These principles can be found below. Well done to MMuDS and we wish you the very best for 2016 and beyond! RDC would like to extend a huge congratulations to Mansfield Shire Council and all of the community participants on winning the Attorney-General's Department 2015 Resilient Australia Award! Judges praised Mansfield on their level of community engagement. Last Friday and Saturday (17-18 July 2015) were the first days of the 2015-16 Alpine Valleys Community Leadership Program, and the start of a great ten months for 25 new participants. The Regional Development Company has been involved with AVCLP for over 12 years in various ways. The opening retreat is now the sixth program where we have been delivering directly to participants. And what a weekend it was! Imagine 25 people from across the valleys of the North East, ranging in ages and life experiences, and from a huge variety of workplaces and background. Their common passion is community, and making a difference to the communities in which they live. Then multiply this passion by the over 340 graduates from programs conducted since 1998, and you have an incredibly energetic force for creating the region we love and want to live in. Key elements of any leadership program are building self-awareness, developing skills to work with groups and teams, and understanding how to set and achieve vision and goals individually and collectively. The opening retreat started to lay the foundations for leadership development, and allow the participants to get to know each other and form the important bonds that will sustain them during the program, and in years to come. Participants will now travel the region and listen to the most wonderful speakers on a huge variety of topics that are fundamental to understanding the region. There are skills development days to come, as well as a midyear retreat and a closing retreat. Please contact us to find out more about community leadership development, organisational cultural change or strategic planning, and we can work with you to implement something similar for your region, community or organisation. North East Health Wangaratta Strategic Plan 2015-20 launch! 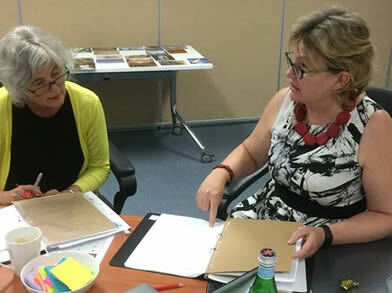 The Regional Development Company was privileged to facilitate the launch of Northeast Health Wangaratta’s (NHW) Strategic Plan 2015-2020 at its Community Forum in Wangaratta on Wednesday, 1 July. At a well-attended, proactive and positive forum comprising members of NHW’s hard working Community Advisory Panel and a broad, representative cross section of the community, participants explored the key aspects of the Strategic Plan. One of the most exciting elements for The Regional Development Company in partnering with NHW and its community is helping them to achieve their goal of continually evolving and refining services and models of care so that NHW delivers comprehensively as the ‘local health service’ to the north east Hume Region. As deserving recipients of the Premier’s Health Service of the Year Award (2014) and the Studer Hardwiring Excellence Award 2013 (Australasia) it also means NHW provides many higher level and advanced services, similar to that which might be expected of a larger specialist, referral health service. Key priorities for NHW in its 5 year Strategic Plan 2015-2020 that were explored at the Community Forum, include achieving the funding required to progress to the planned, next stage of development for NHW. Specifically, there is the need for an expansion of the NHW Emergency Department and an increase in ward beds, along with a refurbishment of the Community Care Centre to enable additional outpatient services to be established. Implement effective consumer engagement methodologies including how services are delivered to be relevant to the requirements of consumers and their carers, and how consumers can be engaged in the process of ensuring the service system is meeting their current and future needs, particularly in the face of changing community expectations and increasing financial restraints by consecutive Federal Budgets which in turn will determine the funding available to the State hospital system across the board. NHW is seeking to further consolidate its role as a sub-regional health service over the next five years. In order to do that, NHW understands that it needs to continue building on its community consultation and engagement frameworks to ensure the community it serves continues to have confidence in NHW’s ability to meet their healthcare needs. Therefore, NHW’s commitment to work with their partners and the community is critical to developing enhanced community support, driving organisational improvement and ensuring an integrated service network across the Hume region. The Regional Development Company is excited to be part of the NHW team in building and strengthening these partnerships and delivering successful outcomes for the long term. Please contact us to find out more about this strategic community engagement process and how you can implement something similar for your organization. Mansfield Shire Council’s Growing Inclusion Leadership program concluded yesterday. The program was designed and delivered by The Regional Development Company and the Disability Advocacy and Information Service (DAIS). The program worked with participants on developing personal awareness and leadership skills, with a focus on advocacy for self and others. Participants in the program ranged from senior school students to people representing others with disabilities. A really engaged and wonderful group to work with. As a result of the program, there will be new members of the Mansfield Access and Inclusion Committee – people with disabilities providing additional insights and feedback on services, access, opportunities and needs in Mansfield Shire. Congratulations to the Mansfield Shire Council for such a great initiative. Congratulations to Mansfield Shire for an engaging and successful Community Conference. 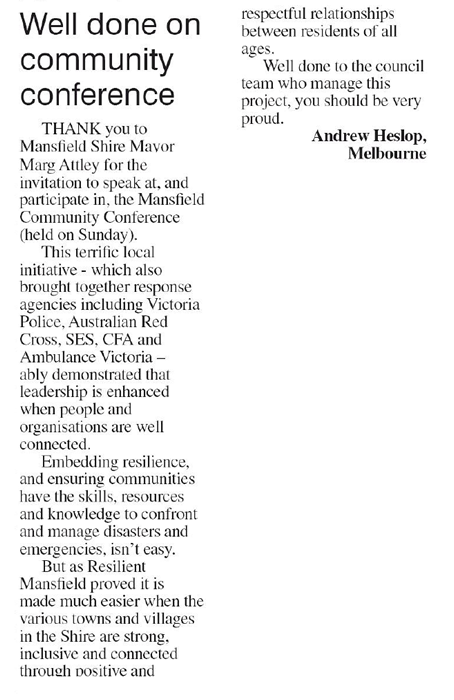 These Mansfield Courier articles are a credit to you, and to the Community Resilience Leadership Program participants. It has been fun being involved. Tough times don’t last. Tough communities do. How tough are we? Through a series of exciting initiatives The Regional Development Company is privileged to work with the Mansfield Community as it develops its community leaders and builds community resilience. In understanding that the inherent characteristics in strong, resilient communities most often include attributes like leadership, networks, knowledge and ready access to information, infrastructure for social activities, a strong volunteer base and partnerships with other communities and organisations, the Mansfield community set about Resilience Development. The key to the success of this approach however, is that the community own its development plan; the Mansfield Shire is working in partnership with the community and it is an incredibly social, positive, rewarding and long lasting journey. Starting in 2014, the inspirational Community Resilience Leadership Program facilitated by The Regional Development Company brought together a broad cross-section of passionate and connected local community members to explore and expand their leadership role in building community resilience and to develop action plans which address local issues. 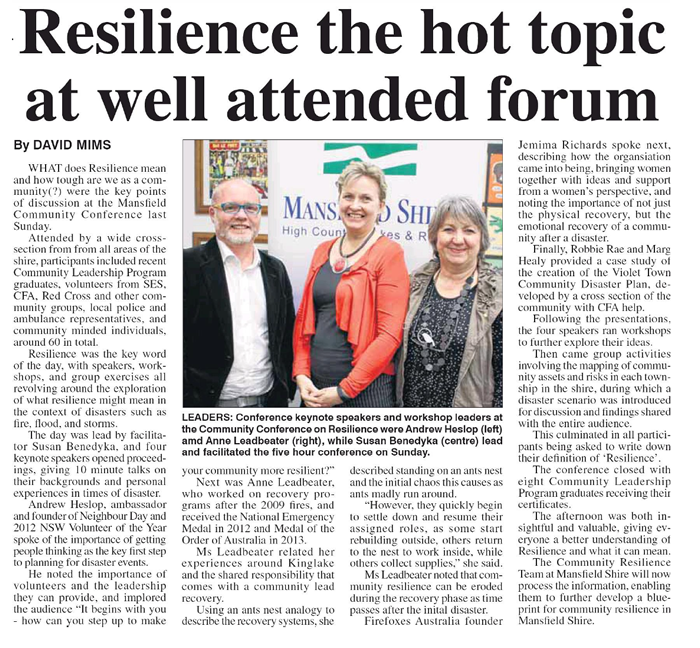 The next step was for those emerging leaders to share their visions and learnings from the program, and alongside their community peers and invited guest speakers with backgrounds in emergency recovery and resilience development, participate in the Mansfield Community Conference 2015 (Sunday 24 May). Exploring the key theme “Tough times don't last. Tough communities do. How tough are we?” this year’s conference examined in depth, the readiness of the Mansfield community to recover from crises and to drive their own futures. And, as all great community events do, this one concluded (for now) with a 'street party' style BBQ dinner and a mini Emergency Services expo. However, this is not the end of the journey. The Mansfield Shire is committed to continuing to run the capacity building workshops and they are always seeking suggestions from communities for workshops that would address any expertise gaps. They are also continuing to run the bi-annual community conference and community expo. All of this in partnership with the community which will, without a doubt, result in the community achieving its vision for the future. Growing Inclusion Program - in partnership with DAIS & Mansfield Shire Council! RDC is delighted to be partnering with DAIS (Disability Advocacy and Information Service) and Mansfield Shire Council to deliver leadership training for people with a disability, or those advocating for people with a disability, who wish to take on further roles in the community, including advocacy and participation in community through committees and boards. The purpose is to introduce pathways and skills in community leadership and decision-making that will enhance the lives of participants and the lives and wellbeing of others. The program is running from through May and June 2015. The first session was held in early May and involved participants learning about themselves and others through understanding their own (and others’) temperaments, communication styles and driving values and needs. The next session will be solely about understanding advocacy for self and others. Further sessions will cover personal goal setting and action planning, dealing with conflict, effective ways to express opinions and influence decision making, giving and receiving feedback, working with others to create a vision and achieve it, understanding how committees and boards work, project planning, and reflection skills. Another awesome AVCLP Final Retreat and more Governance Training! What another amazing final retreat with such great leaders emerging from the AVCLP 2014-15 course! Blown away by such wonderful talent and passion for community leadership. Thanks for letting RDC share the journey! Are you considering joining a Board and would like to understand the responsibilities of directorship? Could your Board improve its standard of governance? Are you currently serving on a Board and would like to increase your personal skill level? How do they tell the story of the organisation? Class size is strictly limited. Please enrol early to avoid disappointment. Greater Shepparton Community Leadership Program Launch! 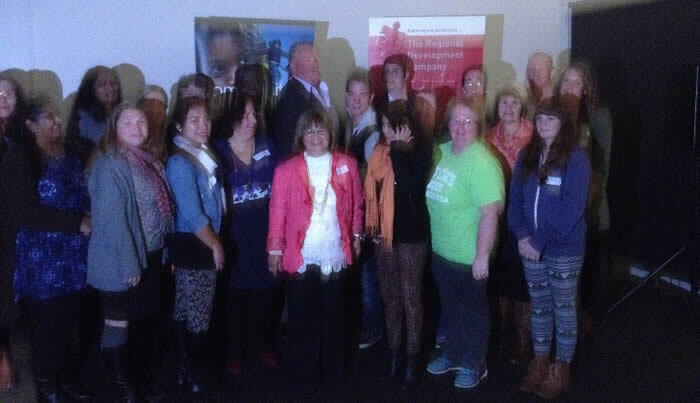 Last night we launched the Greater Shepparton Community Leadership Program. What a fantastic night we had. The launch was exciting and fun. We had some past participants, the new crew and mentors in attendance. The catering was wonderful too! (Thanks Trecia) We are really excited for the future and the outstanding program we are going to have! All of the RDC team hopes you had a very merry Christmas and a happy New Year! We have just started back at work on Monday and have finished reviewing 2014. 2014 was a great year, and we were very fortunate to work with some wonderful people and organisations. We worked with our clients on projects spanning community services, community development, health, education, youth, infrastucture, natural resource management and economic development. Within organisations, we provided tailored training, team bulding, conflict resolution, organisational development services, workforce planning and mentoring. We wish for your continued success in 2015 and beyond! We hope we are able to be of service to you. If you wish to contact us, you may do so here or by phoning 03 5722 2207. 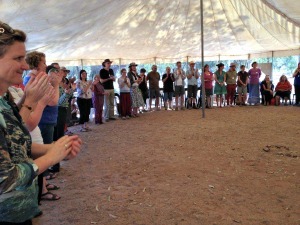 Susan and Suz attended the Australasian Facilitators Network Conference in Alice Springs in September.